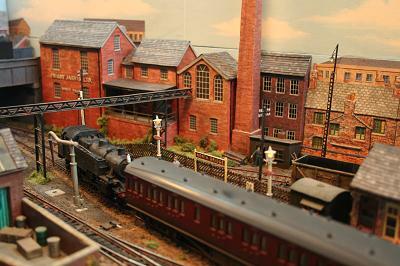 The 7 foot Broad gauge of the Great Western Railway lasted from its opening in 1838 until its removal in May 1892. 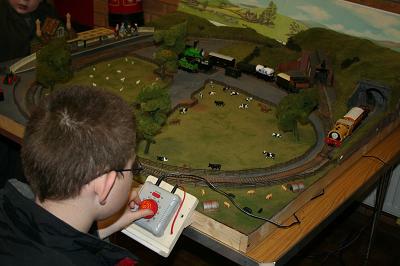 This is a fictitious terminus of a branch of the Bristol and Exeter Railway in Somerset. 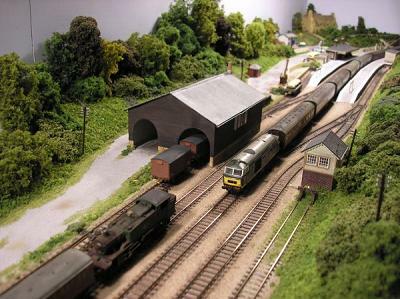 Lord Bodger, the local landowner and entrepreneur put up the vast majority of the money needed to build this line in order to have his own access to the railway. He had his own private saloon and took his horse and carriage with him when he travelled. He may be found around the station in his distinctive top hat. 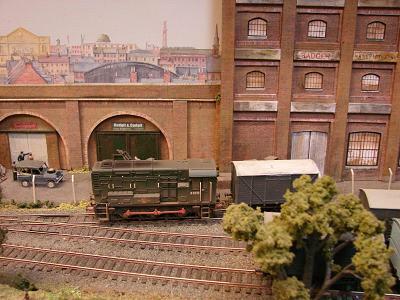 This layout has been built as an exercise in modelling the Broad Gauge in 3mm scale. 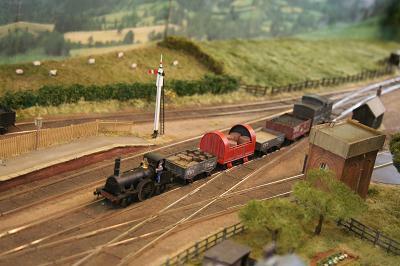 The track and wheel standards are the same as those used for the 3mm society fine scale but to a gauge of 21mm. 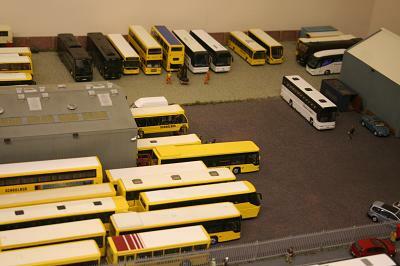 All the stock is hand-built with some modification of standard gauge kits. 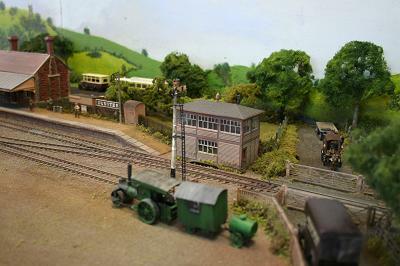 The track is constructed using Broad Gauge Society 4mm scale bridge rail soldered to copperclad sleeper strip. 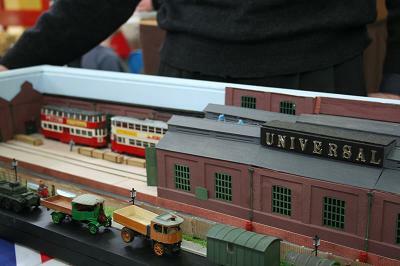 The railway buildings are models of Broad Gauge prototypes. 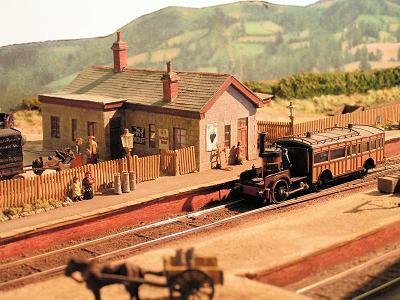 The station building is from Watchet on the West Somerset line, the goods shed is from Henley-on-Thames, in Oxfordshire, and the engine shed is based on a picture of the original one from Watchet. I hope that I have portrayed the spirit and flavour of the Victorian railway era as epitomised by the 7 foot Broad gauge of Isambard Kingdom Brunel. A fictional location set deep in North America’s resource rich "Frontier Land". Extreme railroading in the Rocky Mountains of Colorado, the town of Bootlegger is a rough tough place; this is the real "Wild West", the "West" that Hollywood did not show you. The year is 1925. The town of Bootlegger Canyon is a major railroad junction; it is the hub of the Denver, Darius, South Park and Pacific Railroad (DDSPR). Coal is the main source of freight traffic with rich veins of Anthracite running throughout the area; add this to livestock and the timber trade and you have a classic old west railroad town. Bootlegger was given its name by early prospectors; the area was renowned for the brewing of illicit alcohol which went on in the densely wooded areas of the Canyon. However heavy logging has changed the landscape in recent years, the extraction of the Rockies natural resources have decimated some areas, this is the era well before any concern for the mountain environment. When surveying a route for the DDSPR from Denver through the Platte Canyon towards the first mines at Darius, Leadville and Mt Zion it was clear that gradients of 4 per cent could not be avoided. This would not only make it difficult to haul trains from Denver into the Rockies but also to safely manage full coal trains back down through Bootlegger. 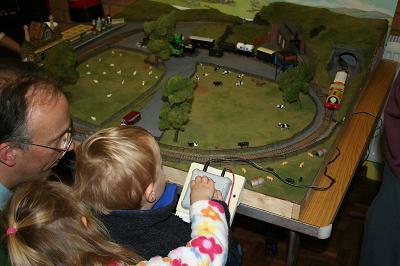 The tight curves and steep grades mean the only option was to use a narrow gauge track. Our town grew situated here at the western end of the 10 mile long geological fault that is the Canyon; it was a natural course for the railroad to follow on its final part of the climb into the Rockies and actually saved the railroad builders the need for a substantial tunnel. 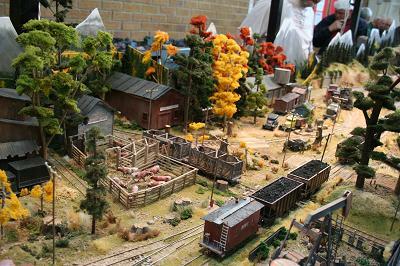 Bootlegger Canyon is my third exhibition layout. 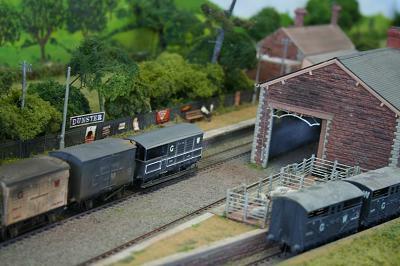 This time I wanted to produce a rural, scenic diorama, a definite departure from my previous urban based railways. The Bachmann On30 revolution has caught my imagination in recent years with some amazing ready to run items of narrow gauge rolling stock. 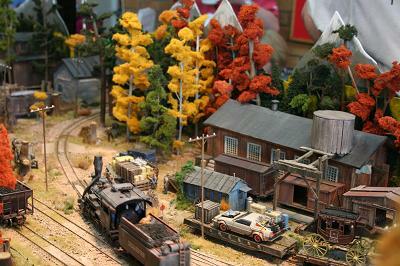 Add this to some inspirational photographs of the present day preserved 3 foot gauge railways of Colorado. This part of the world has the most amazing scenery but when I saw photographs of autumn in the Rockies I was hooked. It is unusual to see a particular season modelled in any gauge so I decided that it had to be autumn in Bootlegger Canyon, Colorado. 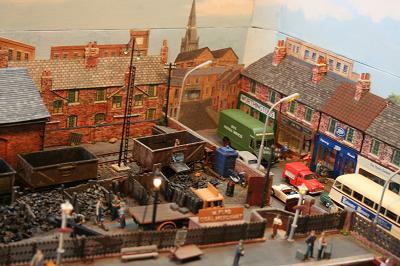 During the 1950-1960 steam period, Hillton was a thriving terminus station with a turntable and shed. 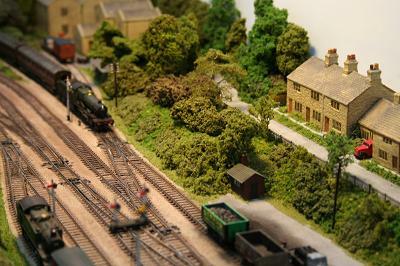 Due to the Beeching cuts of the 1960's, Hillton was closed and left to decay. 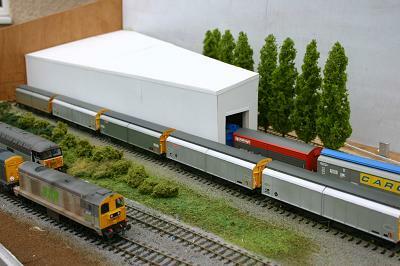 In the mid 1990's EWS and Network Rail needed a site for a new Traction and Maintenance Depot. 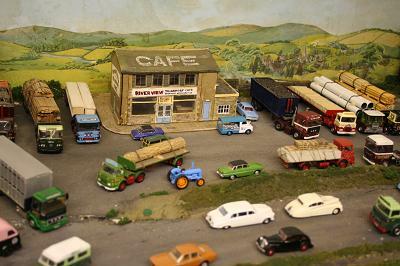 The land on which the old steam depot once stood was flattened and redeveloped into a modem maintenance facility and a work base for drivers. Due to public pressure and a grant from the Welsh Assembly, the old station was re-opened as a single line terminus and was re-connected to an old branch off the main line between Newport and Gloucester. 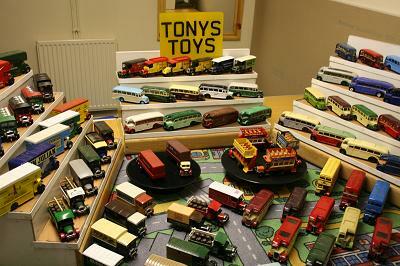 This proved very popular with people from neighbouring towns and villages. 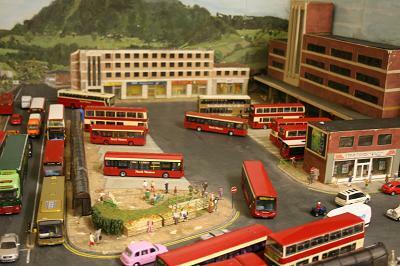 With connections from the branch to most major cities; commuters now travel to Gloucester, Bristol, Newport and Cardiff. 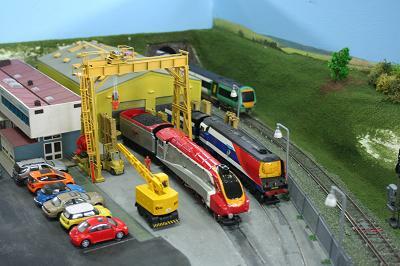 The new depot is in a convenient location to service and maintain the regions EWS locomotive fleet and is used by other companies from both South Wales and the West of England. 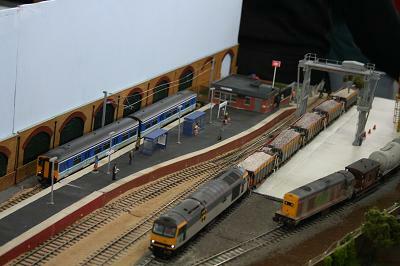 The depot is very busy with locomotives arriving and departing for turns of duty and for maintenance and re-fuelling. It is the early 1960's. You are returning to the West Midlands via Oxford and Worcester after a hard week in London. It is midsummer and the sun is warm through the carriage window. You are drowsy and you doze off. Somewhere north of Oxford you wake suddenly. You look out of the window passing through a country station. You just catch the name "Marsh Chipping" and as your eyes close once more you think, "strange, I don't remember that on the way up." 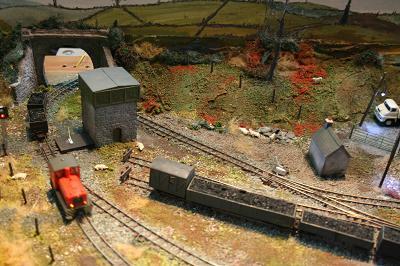 Marsh Chipping is, of course hctional, but the track plan is based on Chipping Campden (with an added branch) and the goods shed on the one at Moreton-in—Marsh; hence the name. Our 1965-ish 3rd rail BR(S) Nictun Borrud is a layout which was based on the US Army building a branch line during World War II. Had it been built it would have come from the Meon Valley Line to Southwick House (SHAPE HQ in World War II) just behind Portsdown Hill, near Portsmouth. As co—builder of Nictun Borrud, I liked it so much I thought I would replicate it and bring it into the 21st century based on it surviving the Dr Beeching cuts and prospering to day (and to run my modern stock). 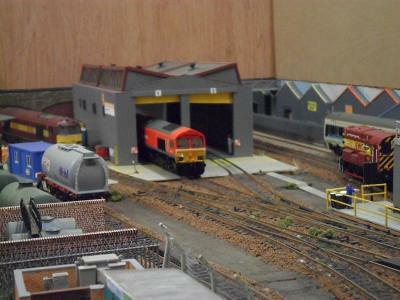 The goods yard has gone, replaced by a car sales and petrol station and the old World War II military sidings developed to house a wagon maintenance facility. The Sub Power Station has also been upgraded.